Geisinger Health System (GHS) is an integrated health services organization. GHS serves more than 2.6 million residents throughout 44 counties in central and northeast Pennsylvania. GHS is considered to be at the forefront of innovative care, with products and services aimed at improving quality, efficiency and value. Population health strategies such as ProvenHealth Navigator, which wraps services around the patient and ProvenCare for optimizing acute intervention have been highly successful and are widely recognised throughout the healthcare industry. GHS is in the unusual position of being a dominant player in the local health economy. For many patients, it is both the payer and the provider. This means that there is an incentive to reduce activity within the acute setting and to promote preventative measures. It also gives the opportunity to collect more complete data for such patients. GHS views itself as a Learning Health System and this has been recognised by others(1). GHS’s experience has been that the data items that are most frequently viewed and that are viewed by several stakeholders tend to be the most accurate. Sharing data with patients has proven to be an effective way of improving data quality. This is achieved during care contacts and through the OpenNotes system that gives patients access to their notes. The Patient and Family Interface Laboratory aims to develop innovative new ways to involve patients and families in this process, such as OurNotes which could allow patients to add topics or questions to their notes that they wish to cover during an upcoming consultation. GHS considers all issues of data within its data strategy. This outlines its approach to data governance and security, its data architecture, the type of data analysis that is to take place and data commercialisation. The data architecture represents a balance between relational databases, big data systems and high performance computing. GHS believes that the trend is away from traditional relational databases, in favour of an increasingly hybridised system that incorporates elements of big data and high performance computing. The data strategy also determines what sort of analytics that the organisation will undertake. This can range from highly advanced experimental mathematical modelling, that might have a high failure rate, through slightly more proven modelling techniques, through to run of the mill business support functions. Decisions on data architecture and data strategy need to be explicit and driven by the needs of the organisation which is part of broader organisational strategy. These decisions will determine the sort of staff and hardware required. The Learning Healthcare Systems Technology Laboratory within GHS aims to harness all of these resources to address a limited number of issues that have proven very difficult to manage. These have included severe childhood illness, asthma and post-discharge event reduction. Outcomes and process measures have improved and in some cases, costs have been reduced with the application of this approach. 1. Process automation: It has been recognised that clinicians have traditionally spent significant time performing basic tasks that would not constitute working “at the top of their license” and where their involvement does not add value. There is also an acknowledgement that clinicians are already busy and that adding to their workload is unlikely to result in adherence to system improvements. Certain aspects of the routine management and preventative interventions for well patients have been automated. This has increased the likelihood of it occurring and has freed clinicians to focus more time on managing the minority of patients with multiple active chronic conditions. Within consultations, a new initiative called SuperNote, has been launched to improve the quality of notes by starting to prepopulate clinic notes with existing data. 3. 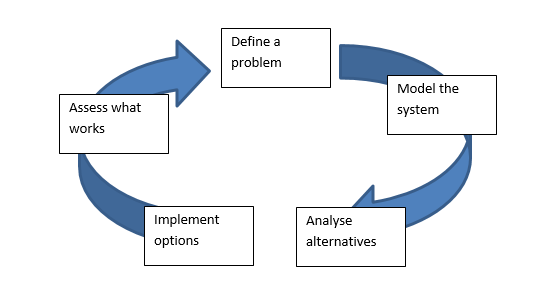 Predictive modelling: A team of clinicians and industrial systems engineers within G develop predictive models that use routinely collected data to identify situations where intervention could avoid costly situations that adversely impact patient care. Examples include models to predict unplanned readmissions, spikes in hospital activity and patients who are likely not to attend appointments. In the later example, some clinics were experiencing no show rates of up to 47%. Patients were not receiving the care that they needed and clinic time was being wasted. A model was developed that drew 100 predictive variables from the EHR. This was refined until the 40 best predictors were identified. The model now stratified all patients according to their no show risk. High risk patients receive a phone call from the clinic prior to the appointment. This has resulted in a 24% reduction in no shows. 4. National and international collaborations: GHS takes part in several national collaborations that are progressing towards a national LHS in the US. One current example is the eMERGE project(3) on precision medicine that aims to gather genetic and longitudinal data on one million people. GHS reports a willingness to engage with such projects where there is a benefit to them and their patients. These projects demonstrate leadership in a particular field, but they may also carry direct and opportunity costs for the organisation. Often publicly funded projects publish all of their data immediately. While this is positive, it does mean that organisations who do not invest any effort in the collection process receive just as much benefit. There can be an incentive to invest limited resources in making use of such data, rather than in helping to generate it. GHS recognises the potential benefits of collaborating with other providers but is somewhat restricted by the competitive nature of the health system. They have considered that international collaborations, with organisations such as the NHS, might avoid this potential conflict. So far, there has been little funding to support such collaborations. 5. Collaboration with local partners and competitors: GHS has a number of competitors within its geography. In recent years, there has been a recognition within GHS that if patients can be treated closer to home and in appropriate setting, then this can be better for the patient and can reduce costs. This has meant that many GHS plan patients are now treated in local independent hospitals or by independent practitioners. This creates a data challenge that has been only partially met. For these patients, GHS has access to complete claims data but sometimes incomplete clinical data. They have found that when they have access to all of the data, care quality is improved and cost is reduced. They have employed a number of techniques to improve the return of data. Compensation has been used to “focus attention” but on its own, has not been sufficient. GHS has attempted to eliminate “no value work” and automate as much of the process as possible. Outcomes and process measures, for GHS and the other locations at which care is provided to its patients have been published. This has only slowly begun to change behaviour. 6. Consultancy support: GHS has recently launched, with venture capital support, a consultancy arm called xG Health Solutions. This arm aims to take innovations developed across the organisation and to help other health systems to implement them. GHS employs a biomedical ethicist and works with external ethicists to consider the way that it uses routinely collected data within its LHS. There is a focus on communicating well with patients during the consent process. There is a feeling that most patients expect their data to be used to improve care and that in the past, poor communication at the point of consent has actually created worries about data sharing among patients rather than allayed them. 1. Ginsburg G. Medical genomics: Gather and use genetic data in health care. Nature. 2014;508(7497):451–3. 2. Institute for Healthcare Improvement, (2015). The IHI Triple Aim. [online] Available at: http://www.ihi.org/Engage/Initiatives/TripleAim/pages/default.aspx [Accessed 20 Feb. 2015]. David Ledbetter, PhD, Executive Vice President Chief Scientific Officer, Geisinger Health System. Ken Wood, DO, Chief Medical Officer Geisinger Medical Center, Director, Center for Clinical Re-engineering, Geisinger Health System. Jon Darer, MD, MPH, Chief Innovation Officer, Center for Clinical Innovation, Geisinger Health System. Thomas Graf, MD, Associate Chief Medical Officer Chief Medical Officer, Population Health Geisinger Health System. Nicolas Marko, MD, Chief Data Officer Division of Applied Research and Clinical Informatics (DARCI) Geisinger Health System.